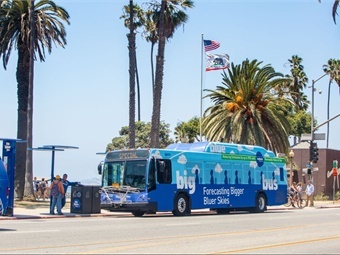 The City of Santa Monica has awarded Clean Energy a multiyear liquefied natural gas (LNG) contract to fuel its Big Blue Bus (BBB) fleet of vehicles. The five-year deal, worth an estimated $3 million per year, will enable BBB to continue using Clean Energy’s Redeem™ brand of renewable natural gas (RNG), rated up to 90% cleaner than diesel and considered the cleanest transportation fuel available. BBB began using Redeem™ by Clean Energy in January 2015. Big Blue Bus, which includes 200 natural gas buses, plans to replace over 100 of their existing bus engines with the new Near-Zero natural gas engine over a three-year period, making BBB one of cleanest transit agencies in the nation. When the transition is complete, BBB is expected to have reduced their NOx emissions by over 90% and their GHG emissions by 8,000 Metric Tons, annually. Introduced by CWI earlier this year, the new Cummins ISL G 8.9L Near Zero 0.02 NOx engine is designed for medium-duty truck, urban bus, school bus and refuse applications and is available on the market today. Cummins-Westport plans to begin delivering an 11.9L version that is also EPA- and ARB-certified for the heavy-duty trucking industry in 2018. Redeem™ is a renewable natural gas vehicle fuel, often referred to as biomethane. It is derived from biogenic methane or biogas, which is methane that is naturally generated by the decomposition of organic waste. The methane gas is processed, purified and sent into the interstate natural gas pipeline and made available exclusively to Clean Energy customers. Redeem™ biomethane vehicle fuel is procured from biomethane production facilities, including two owned and operated by Clean Energy.